Almost three years late and at five times the original cost but politicians, business leaders and passengers all believe the Sheffield to Rotherham will be worth the wait. That was the resounding message as passengers were finally able to enjoy the Government-funded project, which will see services run from Sheffield Cathedral to Parkgate, via Rotherham Central railway station. But those behind the project and those who boarded the first passenger service said the scheme could lead to an economic boost as well as paving the way for similar services across the country. Rail minister Jo Johnson said: “This has been a moment that’s been a long time coming. A lot of hard work has gone in to the project to get it to this stage today and this is a moment to celebrate and to see the start of passenger services because this technology has real potential – not just in South Yorkshire but across the country. Passengers packed onto the first-ever tram train service between Sheffield and Rotherham. Picture: Sam Cooper / The Star. Mr Johnson said the government never considered scrapping the scheme, despite a committee of MPs labelling it ‘how not to run a major project’. He said: “We’re committed to transport infrastructure in the north of England and in the Sheffield area. We are investing £13 billion between now and 2020 on major transport infrastructure projects in the north of England. The pilot scheme sees trams run on the normal Supertram tracks between Cathedral and Meadowhall South, before switching onto the rail network out to Parkgate, via Rotherham Central. Rob McIntosh, Network Rail route managing director for London, North East and East Midlands, said the launch marked the start of a ‘bright and exciting future for transport in South Yorkshire’. Mr McIntosh said that he thought those behind the project announced an estimated cost and timescale ‘too early’. He added: “The first and main reason for the delays was that at the time we said when we could do this by and for how much money, we hadn’t properly assessed how we were going to engineer the project. Mr McIntosh said traffic congestion between Sheffield and Rotherham was one of the reasons the area was chosen to run the pilot scheme. He added: “We are committed to the two-year pilot and we will continually review it during that time and Stagecoach certainly plan to run it for another three years beyond that. The tram-train will run on a black route and be labelled as TT. A total of seven tram-train specific vehicles have been built – four of which will operate on the new network. 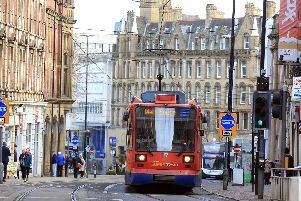 Tim Bilby, managing director of Stagecoach Supertram, said: “This is a pilot project - there wasn’t an off the shelf solution. People estimated timescales but inevitably challenges came up and now we’ve got to the point we can launch we should celebrate. There is a brief pause in services at Meadowhall South/Tinsley while the drivers register on the rail signals. It then goes onto Rotherham Central and Parkgate, where passengers can use a new zebra crossing across Stonerow Way and into the park. Stephen Edwards, executive director of SYPTE, said a number of parking spaces at Parkgate Shopping had been designated as park and ride bays. Coun Jack Scott, Sheffield Council’s cabinet member for transport and development, also welcomed the launch and said he thought it would boost both Sheffield and Rotherham’s economies. Sheffield City Region Dan Jarvis said it marked the start of improved transport services across South Yorkshire. First on board the passenger train was tram enthusiast Antony O’Brien. Shortly behind Mr O’Brien in the queue at the Cathedral tram stop was Paula Smuthhurst and her daughter, Gemma. Paula, of Hunters Bar, was the first passenger to board Supertram when it launched in 1994.